There’s no big Marvel panel this year and the warring clans from “Game of Thrones” are sitting it out too, but there will still be plenty of superheroes. In other words, it’s Comic-Con as usual. The annual installment of the epic pop culture convention and celebration — now nearing it’s 50th year — kicks off in San Diego on Wednesday night and staggers to a close like a drunken zombie on Sunday. 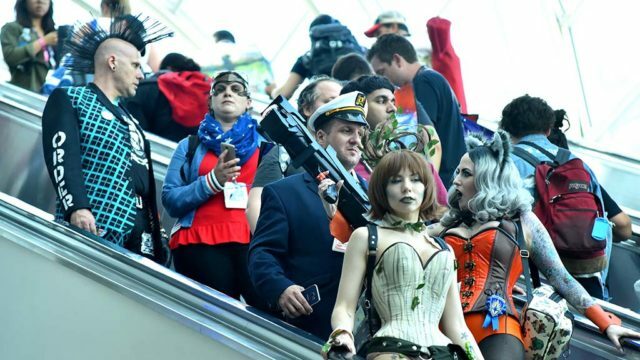 Over that time, an estimated 130,000 fans, vendors, marketing people and yes, even celebrities, will have traveled through the cavernous hallways of the San Diego Convention Center. Much has been made about the absence this year of two major entertainment brands in HBO’s “Game of Thrones” and Marvel. But the global media spotlight will still shine on San Diego during Comic-Con week, and that means other studios and production companies will have more of an opportunity to lure eyeballs to their products. Sony films will preview its upcoming “Venom” movie and its “Spider-Man: Into the Spider-Verse” animated film. Meanwhile, with “Game of Thrones” still in production and absent from any Comic-Con programming, new and returning television series will have more of a spotlight. Two of the most interesting story lines of the week will be on one Comic-Con icon who is making a triumphant return and one who will be missing. “Talking Dead” host, comedian and pop culture podcaster Chris Hardwick will skip Comic-Con after sexual abuse allegations from an ex-girlfriend. Meanwhile, writer/director Kevin Smith will make his usual one-man show appearance in Hall H on Saturday night, just five months after he suffered a massive heart attack. Expect some mordant, funny observations about life and death from Smith. Luis Monteagudo Jr. is a freelance writer and pop culture enthusiast who has attended Comic-Con for more than 20 years. He has written for The San Diego Union-Tribune, USA Today and numerous other publications.